Sophie Hathaway, CAS ’22, was supposed to meet her U.S. Senator, Elizabeth Warren, on an 8th grade school trip but her train got stuck in a tunnel in Philadelphia and her class missed their appointment on Capitol Hill. 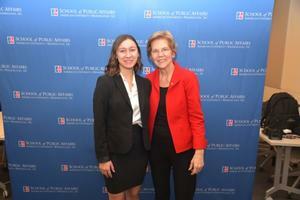 The public health major got her chance on Nov. 29 when Warren spoke at AU, sponsored by AU School of Public Affairs, Kennedy Political Union, and AU College Democrats. “This was sort of like the universe falling into place and finally making up for that moment six years ago,” said Hathaway, from Greenfield, Massachusetts. She and Warren chatted about her hometown. After shaking Warren’s hand and before the speech began, Hathaway squeezed in a quick phone call to her 8th grade teacher to tell her the news. “It was really special,” she said. It was hard for Amrutha Chatty, SOC ’21, to keep from telling her family over Thanksgiving in New Jersey that she’d be meeting Warren, but once she could tell them after the event was announced Monday, they shared her excitement. “I look up to her a lot as a role model, especially for women and politics,” said Chatty. In high school, Chatty said she admired when Warren continued to speak on the Senate floor even after she was asked to stop — an episode that sparked a female empowerment campaign. In her speech, Warren focused on her vision for the United States’ role in the world. “It is time to create a foreign policy that works for all Americans, not just the rich and powerful,” said the Democratic senator. As a student with an interest in international studies and China, Sydney Rowell, SIS ’21, said she was eager to hear about Warren’s foreign policy positions. Warren’s remarks paralleled what Rowell had recently discussed in class about the notion of two presidencies — a domestic president and foreign policy president — but the need for one presidency that combine policies. “I thought that was really interesting and she touched on human rights abuses in China and how the U.S. needs to take more of a heavy hand in that and that’s something we’ve been looking at in my coursework,” said Rowell, originally from rural Tennessee who says she was drawn to AU because it was located in a big city that is a hub of political activity. In addition to meeting Warren, Rowell has met former U.S. Attorney General Loretta Lynch and students from Parkland, Florida, when they were on campus. Rowell also had two internships — one working for a Congressional representative and other at The Hill newspaper. “Those are opportunities I would never been able to have at any other school,” said Rowell.